In this post I want to show how I added the XML context file to the Spring application. The second aspect I will show will be the usage of the properties file for the external constants values. All of the code is located at: https://github.com/eyalgo/request-validation (as previous posts). About the modularization and how the sample app is constructed, I will expand in later post. We also need to tell Spring the location of our property file. Suppose you want to add a property attribute to your bean. I always use constructor injection, so I will use constructor-arg in the bean declaration. Suppose you have a class that gets a list (or set) of objects (either another bean class, or just Strings). You can add it as a parameter in the constructor-arg, but I prefer to create the list outside the bean declaration and refer to it in the bean. What if I want to set a list (set) of values to pass a bean. Not a list of beans as described above. Here’s a map with some entries. See how the keys are also set from the properties file. In the map example above we have keys as Strings from the properties file. The values are reference to other beans as described above. In this post I showed some basic examples of Spring configuration using XML and properties file. I strongly believe that until the team is not fully understand the way Spring works, everyone should stick with this kind of configuration. If you find that you start to get files, which are too big, then you may want to check your design. Annotations will just hide your poorly design system. This is the first post of a series of posts demonstrating how we to use Spring in an application. In the series I will show some howtos of technical aspects (context file, properties, etc.). And I will also show some design aspects and test approach. 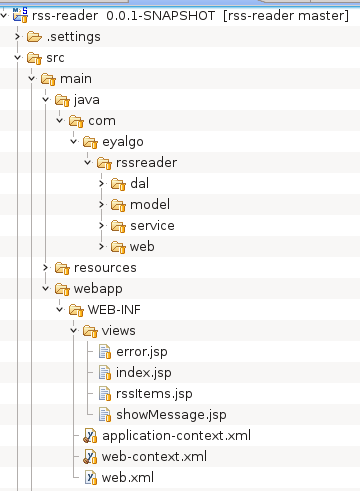 In this post I will simply show how to integrate Spring using Maven. The basic dependency would be the context. Using Maven dependencies, spring-core will be in the project as well. You can see that I didn’t add spring-core as it comes with the context / test dependencies. Some notes about the code. I added the Spring code, context and the Spring’s Maven dependencies to the test environment. I want to emphasize the separation of the validation-filter framework to the usage and wiring of an application. In real life, you might have an external library that you’ll want to use it in a Spring injected application. So the test environment in the code simulates the application and the src is the “external library”.